National Honors Society students help package food for families in need at the De Soto Food Pantry on Nov. 16 and 17. 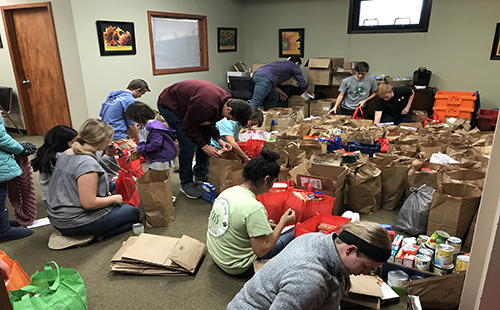 Every year, the De Soto High School National Honor Society participates in service projects that aid the De Soto Community. This year, they decided to volunteer at the De Soto Food Pantry. 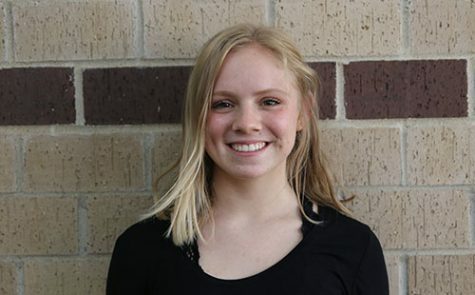 NHS president senior Lizzy Arnold set up the project because of the pantry’s activity during the Thanksgiving season and the fact that it is in close vicinity of the school. Throughout October and November, students from Cats Care, Students Council and NHS collected food that they could use for the pantry. NHS then arranged the Thanksgiving meals and organized the general area of the pantry. They were also able to provide families with gift cards and other items. “When we got there [to the pantry] we helped with giving the people who came in their Thanksgiving meals, which was cans of food, potatoes, pumpkin pie and everything. Then, we gave them a Harp’s gift card and a voucher for meat at Steve’s Meat Market. It was so cool to see everyone’s reactions to those things because they weren’t expecting all of that. 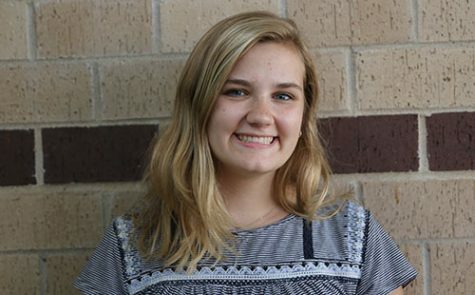 I also helped with organizing the dates of different cans so it would be more efficient to find things,” said senior NHS Member Alyssa Perry. NHS students enjoyed working at the food pantry because it helped open their eyes to some of the things going on in the town. “I think it [volunteering at the pantry] was good because you get a different perspective. I wouldn’t have known the amount of people who might not get a Thanksgiving meal was so high. By working at this food pantry, it makes the community stronger and being involved in it makes me feel like I’m apart of something bigger than myself,” Perry said. Second semester, NHS will have another service project. Arnold has been in the process of arranging a Special Olympics at the school that members will help run.